It’s been a while since my last post because so much has happened this past week, leaving me very disoriented and feeling down. Last Thursday I received a message that my 31 year old cousin passed away in Syria. Shocked and upset I thought that he died as a result of the conflict, revolution, whatever you want to call it. But that wasn’t the case. A husband and a father of two (a 7 and 5 year old), he suffered a stroke and died before getting to the hospital. It happened on mother’s day (in the Middle East) after he visited his mother and when he was about to leave his in-laws’ home with his family. I really have so much to say, but not enough concentration to organize my thoughts. Current events in Syria have gone out of control, and I can only hope and pray that it ends sooner rather than later. I feel like many Syrian people have been blinded by their hate, greed, vengeance, and lack of forgiveness. What ever happened to humanity? Have we become so desensitized when it comes to death? Or did we forget how precious the gift of life is? I made this flag as a small tribute to all the lives lost in Syria. The fact that they were considered “friends” by some and “enemies” by others is not important. I wanted this flag to be full of life in a time when death is all around, and to keep us hopeful during this difficult time. 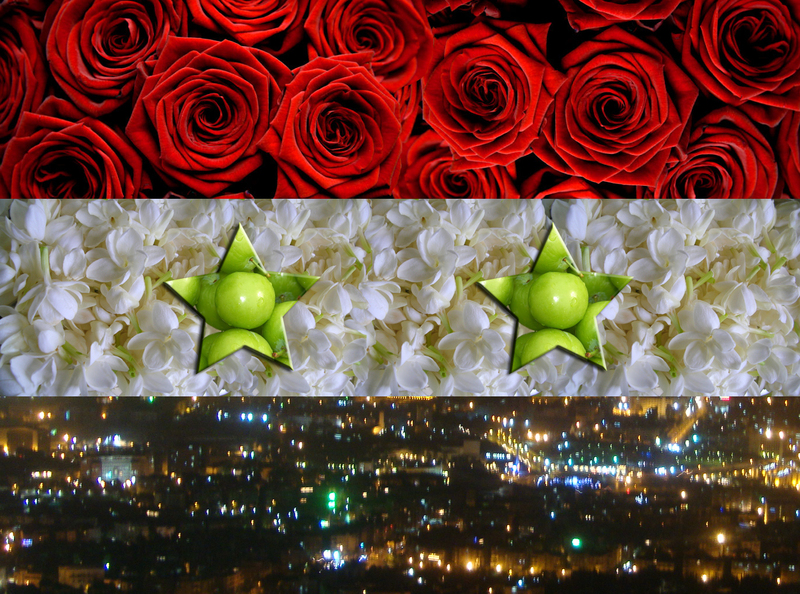 I used a picture of Damascus taken on my last trip there, along with other pictures that typically represent life in Damascus: Roses, Jasmine, and Green Plums. Today I pray for my cousin and his family, and for Trayvon Martin and his family. I pray for every mother who has lost a child, and I pray for justice to be served to those who deserve it. And I pray for all humanity to wake up, and start feeling for one another. Life is too short, so reevaluate your priorities, say sorry to someone, and simply forgive. You never know when it’s going to be too late. ** Some of the images I used were from: webdesign10, weloveourbangladesh, wintorez. Madness grips the land, tragedy unfolds and the world looks on…what sorry creatures we’ve become. I am so sorry for your cousin’s demise Rasha. So sorry for all the families who’ve lost their loved ones to violence and indifference. thank you so much Eric for your words, they are much needed in this crazy world..
Beautiful post! Words and flag! So sorry about your cousin. In conflict and troubles..people often times forget what is important.. Yes, too often people forget what is really important, thank you for your comment. our condolences. this is a beautiful tribute! I’m so sorry for your loss, Rasha. Life can be incredibly cruel sometimes… but your words here are incredibly moving. And hopefully they bring you and your family some sense of healing. My thoughts are with you. may god bring some peace into this crazy world.. my condolences.. I am Syrian and even that most of family is abroad (me too) I still keep Syria in my heart!! The flag you made is amazing, thank you some much for the post! We all pray for Syria now 😦 Inshallah the good people of Syria will have peace really SOON. I truly believe in that. Habibiti thank you so much for your comment, and sorry I made you cry! Unfortunately I still have a lot of relatives in Syria, and my mom is going there tomorrow to be with my aunt. I’m not happy about that, but I understand that she needs to be with her sister. May God bring some much needed peace into this much chaotic world, and to my beloved Syria.